Stop Using Wrong Japanese writing For Your Tattoo Design! Get 100% Accurate Japanese kanji, katakana or hiragana alphabets by using our English to Japanese writing translation! In 48 hours, you can get your Japanese writing guaranteed to be 100% accurate and says exactly what you want to say! Many people use the WRONG Japanese writings unknowingly, especially for their unique tattoo design. So, that's why I am here to help you to translate your English words or name into 100% accurate Japanese kanji katakana or hiragana writing which says exactly what you want them to say. I'll PREVENT you from using the WRONG Japanese writing for your logo, jewelry or tattoo design. Kanji is the most popular Japanese alphabet, especially for unique tattoo designs. 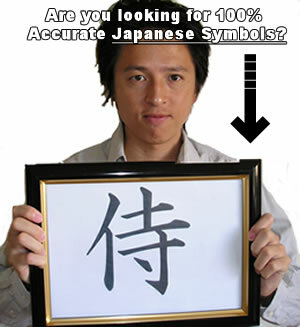 If you want to Get 100% accurate Kanji wrting, please ask Japanese Kanji translator, Takanori Tomita. If you want to convert your English name to Japanese name wirting, ask Japanese name translator and see how your English names can be written in Japanese alphabets. Would you like us to tranlsate a English word or phrase to Japanese writing and design with your favourite color? Japanese wrting translation with color design is a unique design service for your tattoo design! Would you like us to translate your zodiac symobols into Japanese kanji symbols? 30 Japanese Kanji wirting with 4 different Japanese Calligraphy and Stencil Fonts. All the characters are based on the the way of SAMURAI concepts. >> Check out this kanji ebooks! Contains the historical Japanese phrase, "Yoji Jyuku Go", written using only four kanji symbols, along with other famous Japanese sayings. My name is Takanori, a professional Japanese wrting translator. If you are looking for an Englihs to Japanese writing translator for your tattoo design, we will help you to get 100% accurate Japanese kanji, katakana or hiragana alphabet and exactly what you want to say! Copyright c 2006 - 2019 English to Japanese writing. All rights reserved.